» How to easily make a brochure using Word 2016 and 2019? How to create input and message boxes in a Word document? How to run a macro using a button in Word 2016? How to insert macros into Microsoft Word 2016 and 2019 documents? How to easily make a brochure using Word 2016 and 2019? Hello! quick question here. I am in need of defining a flyer for an event i am organizing. Understood that Word ships some nice exemplary templates i can use? Any pointers are appreciated! In Marketing, brochures are typically used to get people to know, understand and talk about your product, company or event. The good news are that you don’t have to be a professional marketeer to create and print professional brochures. You can use built in templates on top of Microsoft Word to create your own great looking brochures, pamphlets, flyers and leaflets. In today’s post we will provide a step by step guide for defining and printing inexpensive brochures you can use for business or personal purposes using Word 2016. The process is fully applicable to version 2019. Open Word, click on File and select New. Search for a existing templates (either in your computer of Office.com) to jumpstart your brochure creation , or use your own template. Select any one of the brochure templates, check the preview and click Create. A sample brochure is now created. Save the brochure by either by pressing Ctrl+S in the keyboard or click file and select Save. Next step will be to modify the template so it will fit your needs. We can make changes to the images and texts in the sample brochure to make our own brochure. Obviously, there is a great amount of design work you can put into the project, pending your time, budget or skills. In this guide we’ll cover three possible design changes you could implement: inserting and changing existing pictures in a brochure template as well as adding/modifying text. We’ll also cover modifying the layout scheme of your pamphlet by adding new columns. We can change the Image by right clicking on the image and selecting Change picture. 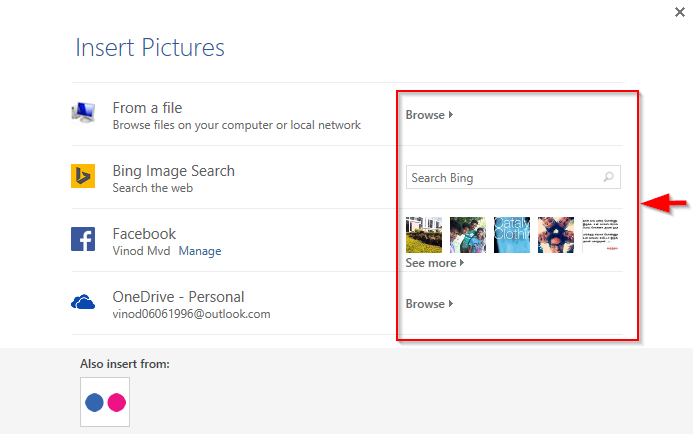 Insert the picture by browsing it from your disk, by using the Bing search,or by leveraging pictures you have uploaded on your Facebook or OneDrive accounts. We can change the existing brochure text, by simply tapping on the text and then adding ro, modifying or deleting it as needed. After finishing your changes to the brochure, press Ctrl+S and save it. Right click on the brochure where new column has to be placed and move cursor to Insert. Click Insert columns to right or Insert columns to left to insert new column to right or left of the selected column. Insert rows above or Insert rows below allows us to insert a new row above or below the page. Inserting cells helps us move the selected cell right and down. Also Inserting the entire row and Inserting entire column will insert a new row or column from the selected column. Using this technique you could also define more advanced flyers – such as tri-fold ones. The Microsoft Word version for MAC OS X also allows you to create pretty cool marketing brochures and pamphlets. Also in this case, we strongly suggest to use a brochure template to speed up your brochure development. From the header menu, select New from Template (of use shortcut shift + command + p). Then in the search box in the right hand side, type brochures. You’ll now see the list of available brochure templates. Now double click on the brochure template that fits your purpose: marketing, sports, fashion, restaurants and other thematic templates are readily available for you. Alternatively select the template and hit Create. Save and customize your brochure as shown above. Got a related question on Microsoft Word? Look into our guide on how to get your questions answered.